I won’t speak much within this post, rather, I’ll let the sentiment above do all the talking. I’ve returned home from the sea. And I’m here for a few weeks before I leave again. There’s still so much for me to catch up on, but I won’t let it stop these regular posts. I’ve been loving bringing them to you. I mentioned in stories that I’ll be leaving to live in Paris for the Winter. And while the European Winter is still so far, the snow-coated dream of it has resulted in many thirstful nights of anticipation. Here’s hoping it dies down before it drowns me completely. I promised a few weeks back that I would share the recipe for this Vanilla Bean Chamomile Cake with Honey Mousseline Buttercream. And here it is. It’s a Spring-inspired cake, though, its character could easily be seen as appropriate for all the seasons. It’s delicate, dulcet, and floral. Honeyed and herbaceous. Rich, too. Though the richness is refined enough without being too over-whelming. I think that’s the mark of a good cake. When it doesn’t feel the need to over-power or be too sweet and complex in order to impress. A single slice is more than enough to sate. The white cake I call my best. It’s got a tight, soft, and tender crumb that stays moist for days. It took work to get the ratio right and it’s finally where I dreamed it. There’s an infusion of chamomile within the cake, which gives the most calming and well-rounded undertone. As well as a hint of orange too, for zest-filled brightness. When paired with a slightly salted honey mousseline buttercream and a little addition of bee pollen, its perfect. A mouthful of sunshine if you will. I think we all need a slice of that. 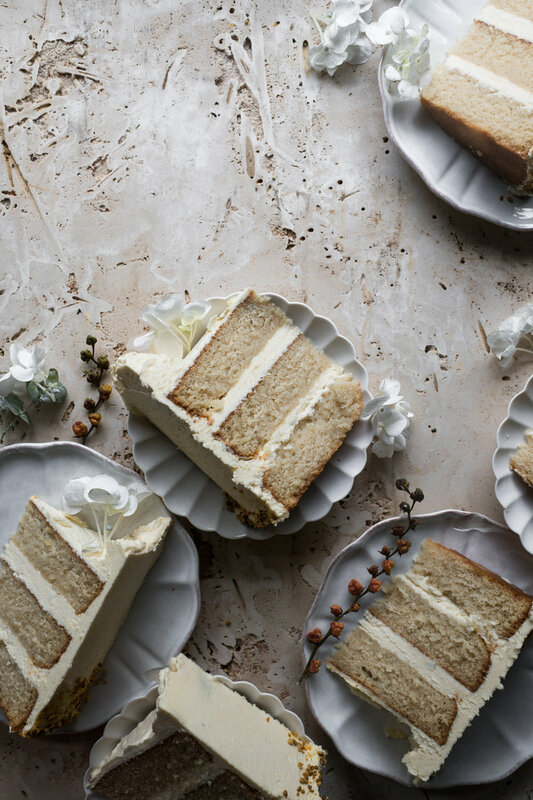 You could infuse the cake with whatever tea you desire according to the season you’re in. I’ve made it before on earl grey, with great results. I can imagine that a smoky black tea in cooler weather would be beautiful too. The cake is made on the reverse creaming method, which uses the technique of incorporating the butter into the dry ingredients instead of creaming together the butter and sugar. The result is a cake that is kept moist for longer, with a finer crumb and bakes up almost always flat. For the mousseline buttercream, I recommend beginning the crème patissiere the day before, so it has time to chill in the refrigerator until completely cool overnight. When it comes to finishing the cake, it’s easier for this stage to be completed beforehand so all your attention can be focused on the other processes. You can also bake the cake layers the day before too, which would make for easier layering. Just let them cool completely before covering and setting aside until needed. First, make the crème patissiere. In the bowl of a stand mixer fitted with the whisk attachment or using a handheld electric whisk, whisk the egg yolks, sugar, cornstarch, vanilla bean seeds, and salt, until pale, thick, and almost doubled in volume, about 3 minutes. Meanwhile, put the milk into a medium sized saucepan set over medium-low heat. Heat, until the milk comes to a gentle simmer. Once simmering, ladle a little of the hot milk into the egg yolk mixture, whisking constantly until well combined. Pour this mixture back into the saucepan with the remaining milk. Continue to cook, whisking constantly, until the mixture is very thick and leaves a trail. Remove from the heat and whisk in the honey. Pour the crème patissiere into a medium sized mixing bowl and immediately cover the surface of it with a layer of plastic wrap. Set the bowl in the refrigerator to chill completely, at least six hours or preferably, overnight. When you’re ready to make the mousseline buttercream, place the chilled crème patissiere in the bowl of a stand mixer fitted with the beater attachment. Mix on medium speed for under a minute to just loosen then add in the soft butter, a tablespoon at a time, until all incorporated. Increase the mixer speed to medium-high. Keep beating until a very smooth, thick, velvety, and glossy buttercream has formed, about five more minutes. If it appears curdled, keep beating and it will come together nicely. Add in the crème fraiche and continue to beat until combined, two more minutes. Use immediately to frost the cake. Begin by making the infused chamomile milk. Place half the milk and the chamomile tea bags into a small saucepan set over medium heat. Allow the mixture to come to a consistent simmer then turn off the heat and set the saucepan aside to let the mixture infuse for 30 minutes. Once infused, strain and discard the tea bags. Combine the infused mixture with the remaining half of the milk and re-weigh it so that you have 350 ml again. You may need to add a little more plain milk as needed to reach the 350 ml measurement. Set aside. Pre-heat the oven to 180 c (350 f). Grease and line 3 x 18 cm cake pans with non-stick parchment paper. Set aside. In the bowl of a stand mixer fitted with the beater attachment, beat the cake flour, baking powder, baking soda, salt, orange zest, and sugar, until the dry ingredients are evenly distributed. Set the mixer speed to medium. Add in the butter, a tablespoon at a time, until it is all used up. Continue to beat for a further 3 to 5 minutes, or until the mixture forms a well combined sandy meal-like texture. Meanwhile, in a separate large pouring jug or mixing bowl, whisk together the egg whites, chamomile milk and vanilla bean extract. Combine the sugar, orange juice, and grand marnier in a medium sized saucepan set over medium heat. Heat, stirring often, until the sugar is dissolved. Bring the mixture to a light rolling boil, then, remove it from the heat. Immediately use a pastry brush to evenly glaze the cut tops of the cakes with the sugar syrup. Place the first cake layer cut side facing up onto a serving plate or cake stand. Using an offset spatula, spread about 4 generous tablespoons of the mousseline buttercream over the top and sides of the cake. Add the second cake layer, cut side facing down. Again, generously spread over about 4 tablespoons of the mousseline buttercream. Gently press on the final cake layer, cut side facing down. Cover the top and sides of the cake with a thin layer of the mousseline then set the cake in the refrigerator to chill the crumb coat until firm, about 30 minutes. 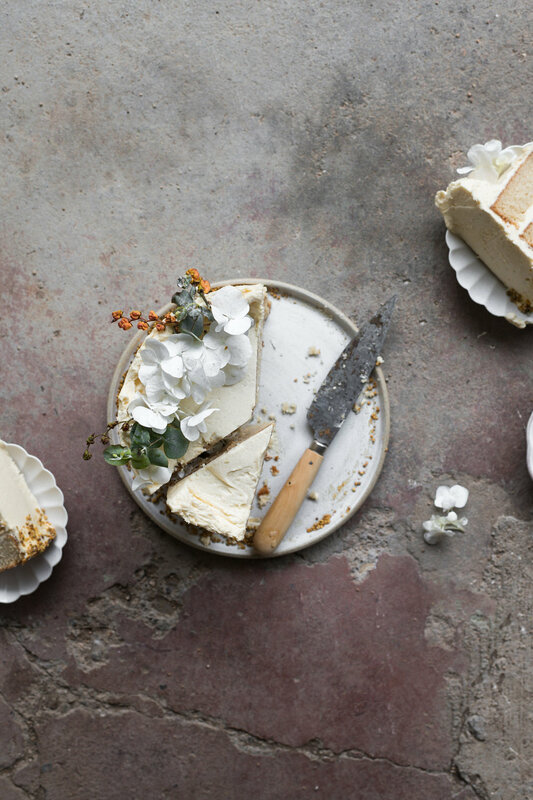 Remove the cake from the refrigerator and use a large offset spatula to thickly spread on a final layer of the mousseline. Decorate the base of the cake with a little bit of the bee pollen by gently pressing it into the buttercream, if desired. Place the cake back in the refrigerator to set for a further 30 minutes, before slicing and serving.